Everose and moss – is this still the hottest Rolex Day-Date on the market? 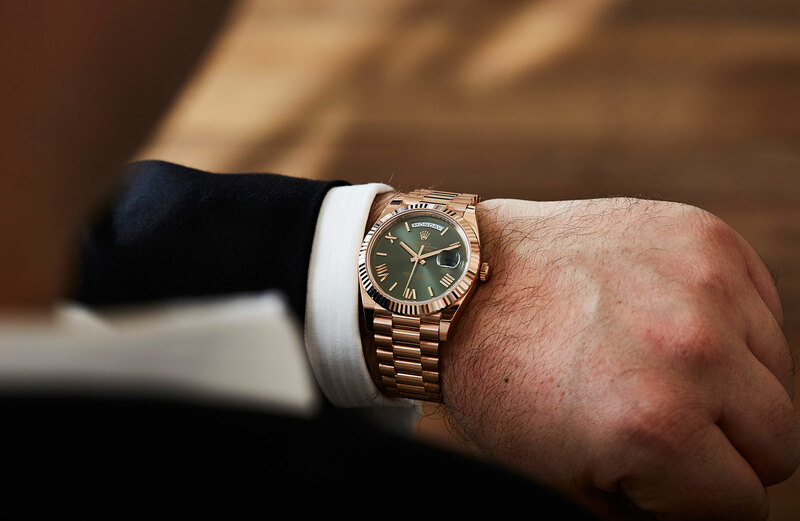 Editor’s note: On its own, a Rolex is a power move. A precious metal Rolex more so. A Day-Date? Now you’re talking? The Day-Date 40 in Everose with a green dial? Winner winner. 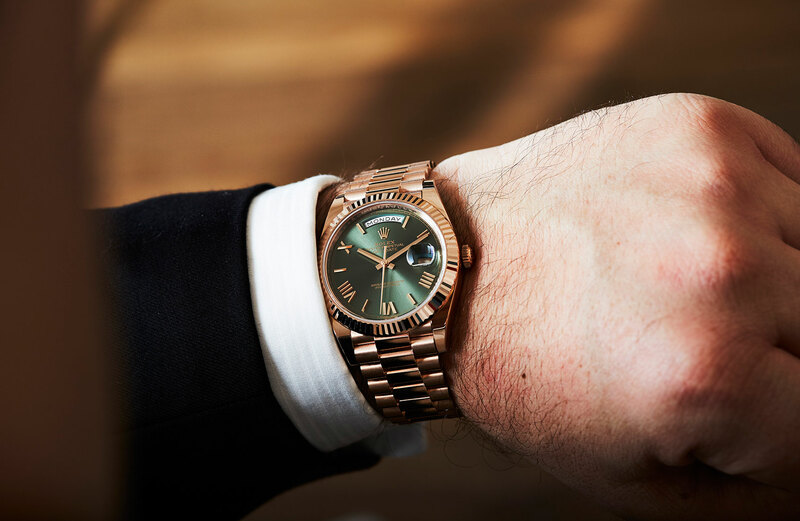 It’s no real surprise that Rolex — the world’s most reputable brand — is a class act. For me this was proven when I saw the beautiful new green-dialled Day-Date 40 on the first day of this year’s Baselworld fair. That class factor was cemented when I discovered the watch was available in stores on the very same day of its release. Not many brands could pull off a move that smooth. On the surface, this is a new variant of last year’s Day-Date 40 (a watch we’ve already covered in some depth) with a dial Rolex is calling ‘olive green’. But it’s more than that. This year marks the 60th anniversary of the Day-Date’s introduction — six decades over which it’s become synonymous with leadership and success — so this new iteration is something special. It’s available in Everose gold and white gold versions, and we suspect that the wait list will be lengthy. As far as the watch goes, it has all the grace, charm and impeccable pedigree of the regular Day-Date 40. The silky smooth Jubilee bracelet, the eternally faceted fluted bezel, 40mm Oyster case and, of course, the next-generation, Superlative Chronometer certified 3255 movement. And while both metals feel wonderful on the wrist, for me the winning combination is that dial paired with the rich hue of the Everose case. It’s a far cry from the bright daylight green of the ‘Hulk’ Submariner, and much closer to a rich moss. This is a twilight green: dark, mysterious and, thanks to the sunburst finish, infinitely captivating. The dial, though, is the real star here. 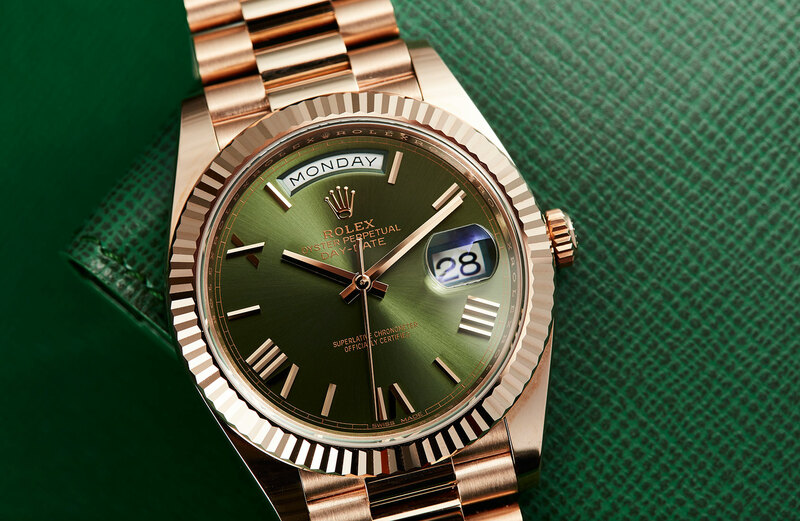 And while Rolex’s nomenclature of ‘olive green’ might technically be correct, it fails to capture the full splendour. It’s a far cry from the bright daylight green of the ‘Hulk’ Submariner, and much closer to a rich moss. This is a twilight green: dark, mysterious and, thanks to the sunburst finish, infinitely captivating. 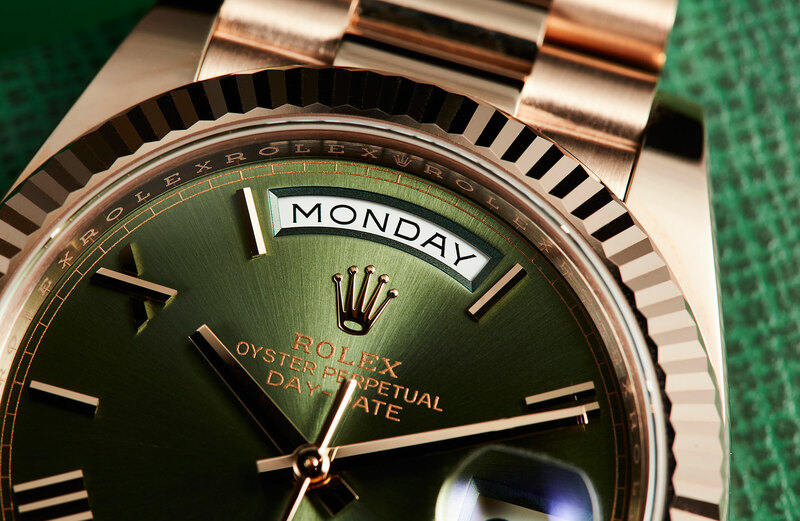 It also happens to be Rolex’s signature colour, so all the more worthy of a celebratory timepiece. The dial text, meanwhile, is gilt print, and the applied Roman numerals are impeccable and thoroughly modern in execution. This is one of the most elegant executions of the Rolex’s flagship watch I’ve seen in a long time, and a perfectly fitting tribute to the mighty President’s 60th year.